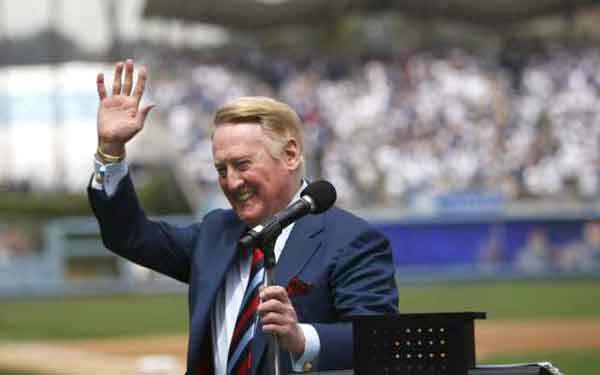 Broadcasting great Vin Scully is scheduled to cover his first game of the Los Angeles Dodgers season today, Tax Day, April 15. Scully missed Opening Day with the team for only the second time in sixty-three years. At eighty-four, Scully’s a marvel. So are the Dodgers, a team that has won eight of its first nine games this young season, as second-year manager Don (“Donnie Baseball”) Mattingly looks to make Scully’s return an even more memorable one, with his club ascending to .900 versus the San Diego Padres. This entry was posted in Baseball and tagged Don Mattingly, Los Angeles Dodgers, San Diego Padres, Vin Scully. Bookmark the permalink.